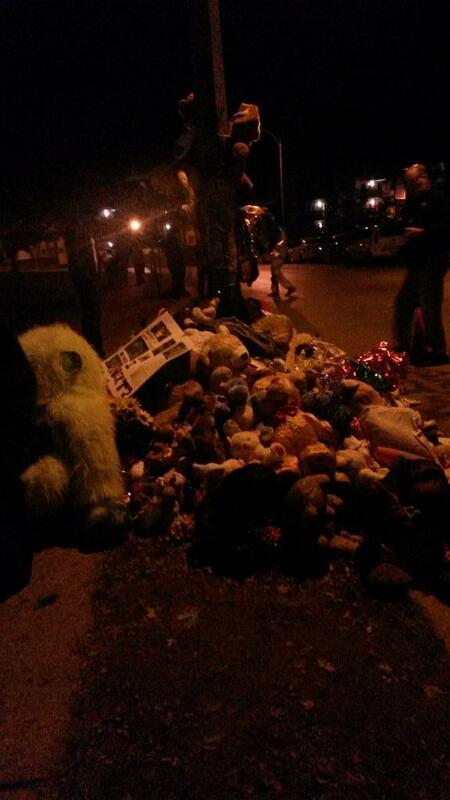 Mike Brown’s memorial outside Canfield Green, October 2014.
people have complained that black people and those acting in solidarity with them should have springboarded a movement off of a different case, that the movement would be doing so much better if it had focused on someone more (in their eyes) sympathetic. First of all, the DOJ’s finding doesn’t mean that the activists were wrong on the merits. The bar for a federal civil rights prosecution is quite high. One version of what happened being credible enough that the evidence doesn’t reach a given bar of our criminal justice system, doesn’t mean that version is or has been endorsed by the government as What Really Happened (do all the people who think that legal innocence equals truth-telling and moral correctness in Darren Wilson’s case also apply that standard to OJ Simpson?). And it is not only reasonable but obvious for people to turn out in protest when a white person voluntarily working for what can only be called, based on the DOJ report, a racist protection racket, kills a black teenager in a confrontation spurred by the black teenager walking on a residential street. Second of all, that’s not how movements typically work. There wasn’t some group of black overlords who sat around saying “Hmm, let’s look at all these police killing cases – which one is sympathetic enough for us to use to start a movement?” People were reacting to a terrible thing that happened in their own town, and were met with overwhelming and vicious force, and then more people reacted to what was going on there. – There’s this DOJ report (are people forgetting that without the protests the DOJ wouldn’t have been investigating? ), which will hopefully lead to some consequences for the powers that be in Ferguson and St Louis County. – Update 3/9/15: As a result of the DOJ report, Rep. Cleaver (D-MO) has introduced a bill to make policing for revenue a federal civil rights violation. – A massive national (international?) movement has blossomed and taken up the causes of lots of other black, and to some extent brown, people who have been killed by law enforcement, in cities from New York to Madison to Los Angeles to Cleveland. That in itself is huge, that this is now being treated as a national mass movement issue rather than something that spurs a few local protests when it happens. – Ferguson and Chicago activists got to testify to the UN Committee Against Torture about police brutality in the US, and UNCAT included a section on police brutality against black, brown, immigrant, and LGBTQ people, in its report and recommendations to the US. – Legislation has been introduced or policy changes proposed by government officials in Missouri, Pennsylvania, New York, and at the national level to require special prosecutors for officer-involved killings. – Legislation has been filed or pre-filed in California, Florida, Georgia, Indiana, Kansas, Michigan, Missouri, New Jersey, North Dakota, Oregon, South Carolina, Texas, and Virginia, to require at least some police to wear body-cams. – As the linked article in the previous paragraph states, there have been more than 40 bills introduced in Missouri, by both Democrats and Republicans, to change police or court procedures, to address not only police accountability but the way that municipal courts are funded (something discussed extensively in the DOJ report). – Congress passed, and President Obama signed, a new version of the Death in Custody Reporting Act (which is meant to make local law enforcement report how many people they kill), that has more enforcement teeth than previous versions. – The governor of Missouri created a whole commission, the Ferguson Commission, to study and make recommendations on both the police and state violence concerns raised by the Ferguson protests, and the underlying social and economic issues, and one of the people appointed to the Commission is a Ferguson organizer. – The Obama administration, because of the Ferguson protests and the police response, did a review of federal programs to give equipment to local police forces and how they are broken. It also created a task force on policing and provided a giant pile of money for police retraining and cameras. – Plus, Ferguson activists got to meet with Obama. Causes can go an awfully long time without presidents even acknowledging them. This one got recognized very quickly in the wake of the Ferguson protests. – The Congressional Black Caucus, inspired by the Ferguson protests, is sponsoring “about 15” young Ferguson activists for their Political and Education Leadership Institute Boot Camp, an “an annual political-leadership boot camp that focuses on leadership development, political campaigns and issue advocacy.” That seems like some fantastic long-game planning right there – the training that those activists get could pay off years down the road. – From Oprah to the TV show Scandal, the mainstream is now talking about the issue of racist policing and killings of civilians by police. The mainstream might not always be talking about it very well, but the conversation is important if this is going to go anywhere. So, um, given all this, I think people who are saying that focusing on Mike Brown was bad strategy need to take a step back here. Because the activists who focused on Mike Brown – and the movement that they springboarded – are doing just fine. This is an incredible amount to have accomplished in seven months!